2015-16 O-Pee-Chee Hockey combines the old-school look and feel of years past with the players of today (and some old timers sprinkled in here and there). Opting for nostalgia over guaranteed hits, it has a big checklist, several inserts and plenty of throwback designs. The base set returns as another 600-card behemoth. The main base set has 500 cards. Players here are all veterans. Marquee Rookie and Marquee Legends short prints return, landing every other pack. Because of the set's early release date before the regular season kicks off, it limits the number of rookies that are eligible for the product. However, there are some notable standouts including Malcolm Subban, Kevin Fiala and Jacob de la Rose. The 2015-16 O-Pee-Chee Hockey base set has several familiar parallels. Retro comes with a new design and lands one per pack. Rainbow parallels return. Landing 1:4 packs, they're not tough but the large checklist makes building a set something of a challenge. There are also Black Border Rainbow parallels numbered to 100. Basic inserts have, for the most part, been changed up. Instead of stickers, they take a glossy theme. 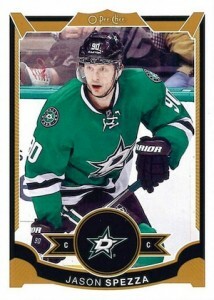 All-Star Glossy inserts are inserted 1:8 packs. Tougher offshoots include All-Star Glossy Skills (1:100) and All-Star Glossy MVP (1:400). There is one insert that continues from last year. V Series B carries on from where the A inserts left off in 2014-15. The manufactured patch possibilities have grown for 2015-16 O-Pee-Chee Hockey. Instead of just logos, some now include players. The product has a total of five different patches: Base Variations (1:147), Rookies and Legends Variations (1:900), Modern Brand Logos (1:540), Vintage Brand Logos (1:1,874) and Mascots (1:4,685). Patch cards combine to land four per 12-box case. Although clearly not a focus in the product, 2015-16 O-Pee-Chee Hockey does have a few autographs. Hobby cases should have a pair of OPC Signatures and one OPC Team Canada Signature Autograph. 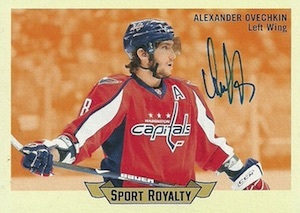 Sports Royalty Autographs, which are signed on-card, are also randomly inserted. Canadian collectors will have another chance to get exclusive cards through a wrapper redemption program. Each of the special packs comes with five exclusive Red parallels plus one of 42 different Mini Glossy inserts. These are a throwback to the separate O-Pee-Chee Glossy sets sold in the 1980s. Click on the linked listings to shop for cards on eBay. 9 cards. View a detailed guide to the promotion. 1:104 packs across all formats. 42 cards. 1 per Wrapper Redemption pack. View full details on the program. Individual pack odds by group are noted below. Unannounced insert. Work in progress. View a detailed guide here. They need something like this for basketball, something cheap with no autos or memo cards that’s easy to find, unlike the nba stickers, which are impossible to find except on eBay. Please uodate the odds on the Woodies cards. I hit a WW-6 Jonathan Toews card. Want to know if its rare or not. Thanks! Denton Edge � Woodies are a surprise insert that was not included on the checklist so there are no odds to add. It seems that they are pretty rare. Has anyone else noticed the three sorts of foil? It seems to me that UD used again the same concept as in O-Pee-Chee Platinum from the last season with the three types of foil cards: normal, rainbow, and black (serial numbered). I was wondering why the normal foil doesn’t appear in the checklist and only rainbow foil and black rainbow foil do. 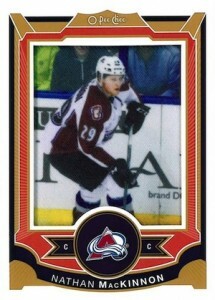 T.C.Boutique � The final checklist came straight from Upper Deck and did not mention another parallel level. We only add things we can independently verify. Trey Treutel – Mea culpa! Indeed, there are only two of them : Rainbow Foil and Black Rainbow Foil. The light was dim yesterday when I opened the boxes and I was very tired. I checked this morning and all the foils are rainbow. T.C.Boutique � No worries. My immediate thought was: dang, how did I miss one on the CL? I give the product 5 stars. I opened 2 hobby cases. Checklist – It’s so big, it’s difficult to have any major complaints about it. Design – Nice design, especially the Woodies. I didn’t really enjoy the All Stars with the fluorescent green, but this is a matter of personal taste. Quality – I always find default when I open UD cases, but this time there were none. Overall very good quality for a set that is mainly made out of non glossy cards. Inovations – I really liked the Rainbow Foil and Rainbow Foil Black idea. The Woodies are simply beautiful. It would have been fun though if they could have been serial numbered. Also, the fact that they are a surprise, makes them even more enjoyable. Notable Pulls – 4 OPC Signatures, 2 Team Canada Signatures, 6 Manufactured Base Patches, 1 Brand Logo Modern Patch, 1 Brand Logo Vintage Patch, 1 Woodie, 7 puzzle pieces (but 3 of them are doubles, so I only pulled 4 different pieces), 3 All Timers (among them there’s the Lord Stanley’s Cup), 2 Award Winners, 48 V Series B, 1 Black Rainbow Foil Rookie with Jersey Number, a misprint of the Burakovsky base card with nothing printed on it’s back, 39 Rainbow Foil Black Base, 4 Rainbow Foil Black Legends, 3 Rainbow Foil Black Rookies, 1 Rainbow Foil Black Checklist. Also, please add to your checklist : Woodies – Erik Karlsson – Ottawa Senators – WW-16. And a question: when can we start to send the wrappers? What?? NO top draft picks? McDavid and Eichel? What are you thinking, Upper Deck? This set looks like crap, unless you want to spend your hard earned money on nobody common players cards. No more O Pee Chee for me! You’ve lost a long time loyal customer. Beautiful, fun to collect, product! I loved the retro cards too. Panini could take notes on how to put out a “set collectors” product- for an affordable price!! Any idea what the odds are on award winners cards? Duncan Keith is number 608. JB � The individual odds and full checklist are listed above on the Set Checklist tab. I don’t think the card with nothing on the back is a misprint, they usually insert blank backs in this set. 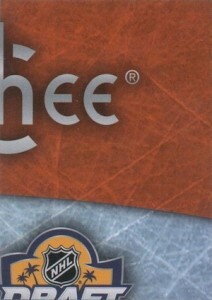 This year O-Pee-Chee was my first hobby box of this product and I’m a little bit disappointed. I’m not a treasure hunter but the price is a bit too high vs the quality. Could have given it a little higher rating, but I think any set that does a Legends subset and leaves out Gordie Howe, really ought to have a serious chat with the decision makers !!!!!!! Disappointment, card design is horrible. I wont be collecting this years O-Pee-Chee. illl save my money for Series One In November. I loved opening my case plus two boxes. 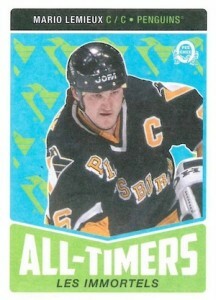 I got the Mario Lemieux Woodies card and love it. It would be nice to know how many are out there, as I have not seen another one. Can Upper Deck say a number? I love this product! I have always liked o-pee-chee hockey cards, I bought one blaster box and got a Aaron Ekblad v-series and Kevin Fiala in the same pack! OPC is always a solid four stars. It’s essentially low grade cards that are nonetheless hard to damage because they are thick stock cardboard. They revert to the 1970s era of collecting. The focus is not the individual “hits”, which really amounts to low yield gambling (you can just watch set breaks on YouTube if you need the rush without wasting money). 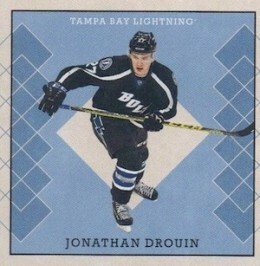 OPC is for collecting the entire set, which is extensive, including even fourth line players. It is a great way to introduce young kids to the hobby, as the boxes are affordable and include a variety of parallels. And the retro cards typically borrow from historical designs. This year it is the 1962-63 Parkhurst look. As for those upset there is no Gordie Howe, Jack Eichel or Connor McDavid, hold your horses. They will appear in the OPC Update, which is often the case. Note that Tavares was card #800 in his rookie year, and Stamkos was #795. Just cool cards. I love the look of them, a more basic design and nothing over the top like a lot of cards go for these days. They still have rainbow cards, signed cards, etc. for the “awww sweet!” feel you can get, but the shiny stuff on every card in the set is for kids..
Quick question… I’m new to hockey and am not in the loop… was there an update set for 2015-16 O-Pee-Chee? 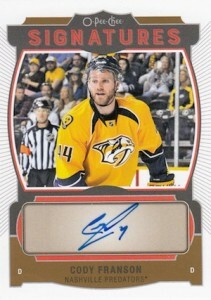 I keep seeing Phil Kessel cards pop up on ebay as a Penguin but he isn’t listed as such in your checklist above. There is just not enough inserts and sub cards to carry on buying Opeechee for me, after buying a full case it’s not worth the money. As well as not even filling a full set of standard cards out of them all. This is minor issue but a pet peeve of mine. I never understood why Beckett and other publications do not consider the OPC update cards a part of this set nor do they consider the marquee rookies actual rookie cards. Who cares if they have a M in front of the number to me its the same as Topps adding a U in front of the number to their update baseball sets which Beckett and other publications do recognize as official rookie cards. Its not like any of the rookie cards in the update set were in the earlier OPC set releases. That in itself should make them official rookie cards. 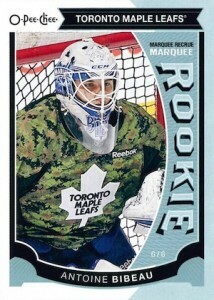 It just seems like the definition of an actual rookie card is never consistent or evenly applied.